The Shake Weight For Men is specially designed to help guys get a stronger and ripped upper body without having to go to the gym. It uses a new workout technology called Dynamic Inertia which helps contract the muscles up to 240 times per minute. This increase in muscle activity makes using the Shake Weight up to 7 times more effective than a regular dumb-bell. 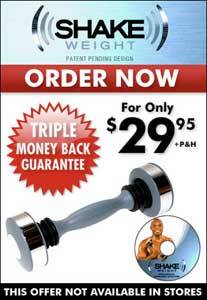 Shake Weight For Men is designed to work out the chest, biceps, triceps and shoulders. You can build definition, size and strength in less time. Unlike the impression created by the rapid motion of the device, the Shake Weight is not battery-powered. The user actually generates all the movement. The internal resistance and shaft bounces the weight back and forth, creating an effective workout that delivers results. The Shake Weight can deliver a complete upper body workout in as little as 6 minutes a day. You can feel the results almost instantly after an intensive workout. What is there to say The product is exactly as advertised. Very few aesthetic imperfections on the weights. They arrived quickly - the day after I ordered them, I believe. I now incorporate these weights into my daily exercise routine. I could not be happier with my purchase.